Manon’s storyline escalated in a way that had me cheering for her. It was absolutely wonderful. Character arc-wise, hers is so in depth and filled with emotion. There’s been few characters I’ve read who go through as much change and internal conflict as she does and comes to terms with it. I loved that she went from a character who believed in emotionless discipline to someone who realized that caring for another creature, witch, or human was not a weakness. She’s part of the group of strong females that Maas has written, and I appreciate it so much. It’s never about the men saving them. Manon takes control of her own life and doesn’t allow anyone to tell her otherwise. Similarly, Lysandra moves from this former courtesan to an impressive force that uses her shifting power in ways that surprises everyone. She’d been treated as a commodity for nearly as long as Aelin was an assassin and now that she has freedom she uses her abilities to get as many different tastes of freedom. I wish there had been more in her point of view. Reading how she dealt with her past as she forged her future would have added a lot to her sections. This time around, though, my favorite side character was Elide. Her entire life she’s been controlled. While she did escape in the last book, I felt like her true potential wasn’t realized. It is in Empire of Storms. She uses what she’s learned by watching the strong women in her life, namely Manon and Asterin, and manipulates situations to protect herself as well as turn them in her favor. She’s consumed by a desire to return to Aelin, yet she also is so terrified that Aelin won’t accept her. She’s similar to Aedion in that aspect; both had things done to them and did things that they’re ashamed of and so are afraid to return to Aelin. They want to return so badly but fear that she will turn from them. What they don’t know is that Aelin also has those fears, but they’re reversed. I loved reading how Elide came to terms with that as well as her journey into strength. Ultimately, I felt that Elide’s story matched Manon’s in emotion. It was hard to read the moments where she was desperate to survive and the moments where her heart hurt. A driving force of these novels and also why I read them are characters like these. I’ve only really talked about the women so far because I feel like they have more to come up against, but the male characters were equally well-written. I can really appreciate when an author makes all of their characters, even the side-ones, important to the story and interesting to read. Back when Manon was introduced in Heir of Fire, I kind of felt like her story didn’t really have a point. To have her progress to a point where she’s vital to the story is amazing. And that’s what happens with all of the characters. They’re first introduced in small doses, planets rotating around Aelin’s star. But in this book, the focus turns to them and I was able to realize just how much they’re all meant to complement each other. They’re all characters that have been told one thing for half or most of their life, characters who are beaten down to the point where you don’t expect that they’ll be able to change and come out of it. That’s what is so beautiful about Empire of Storms. Readers already know Aelin. By focusing on the others, readers are able to truly see how they all have come from these dark places but they don’t allow that darkness to control them. Their similar experiences allow them to heal one another. When characters are around each other for long periods of time, I get why the romances happen. But I felt like there was a bit too much of this book dedicated to the creation or consummation of these romances. I understand that romance is a huge draw, but I also felt like I wanted to know more details about the travelling and growth of Aelin’s Court and people rather than the amount of times they thought about each other’s body parts. I get it. I just don’t need to be reminded of it constantly. Love flourishes even in the worst of conditions, but I felt that the characters lost their focus a bit on the main conflict of their world and that of the novel. While I’m happy with the pairings that Maas set up, I also felt like it was too tidy. Everyone is paired or has the potential for a pairing. As a result, there are some that I prefer over others, and the rest exist purely so there can be some romance when the chapters switch to their point of view. Some of the characters lost a little bit of their importance because they were so focused on the object of their affection. That said, it’s only a minor squabble I have with Empire of Storms. Not everyone needs to be paired and it’s not realistic that everyone is paired in my opinion. 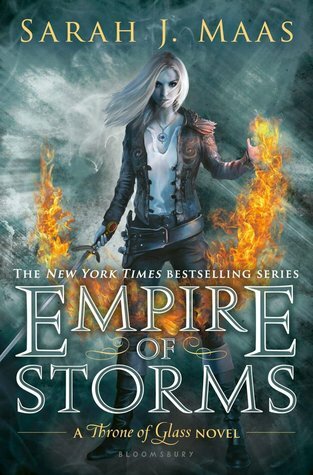 I found Empire of Storms to be the second most emotional book of the series for me. There were so many events happening, some of them behind the scenes, that when they played out or revealed had a big emotional punch. All the pieces came together–all of the things that Aelin had kept from her Court and the reader fell into place. It shocked me at how well Maas had taken all of those separate storylines and knitted them together into one to the point where I wasn’t expecting things to happen. This certainly is the definition of a penultimate book: villains showed their faces, enemies turned into begrudging allies, people were protected, and romances were realized. Like all of Maas’ Throne of Glass novels, Empire of Storms had a cliff-hanger ending that promises lots of conflict in the next novel. I’m very excited to see how this series concludes, yet I’m also afraid to read it because I know that there’s no way everything will be happily ever after. But I can hope for it. Sitting pretty comfortably at 4.5 stars exactly. I liked the plot a lot, but it did get bogged down by the focus on the romances.